The mull is a strip of cloth that is attached to the back of the sewn signatures and the tapes, and is also affixed to the cover boards with tapes. Cut a piece of cloth in a size that can conceal the top and bottom kettlestitches along with the tapes in between them; make sure that your chosen length is at least three inches wider than the back of the signatures so that it can be extended onto both sides. Place waxed paper on both sides of the signatures and keep them in the press such that their back edge is about half an inch above the equipment. Adjust the screws of the press so that it can hold the signatures in place. Ascertain that the alignment of your signature is proper. This can be done with the help of a square; use it to make sure that all the corners form a proper right angle as depicted in figure 66. Also inspect the back edge and ascertain that the surface is even. When satisfied, adjust the press again and tighten it up. 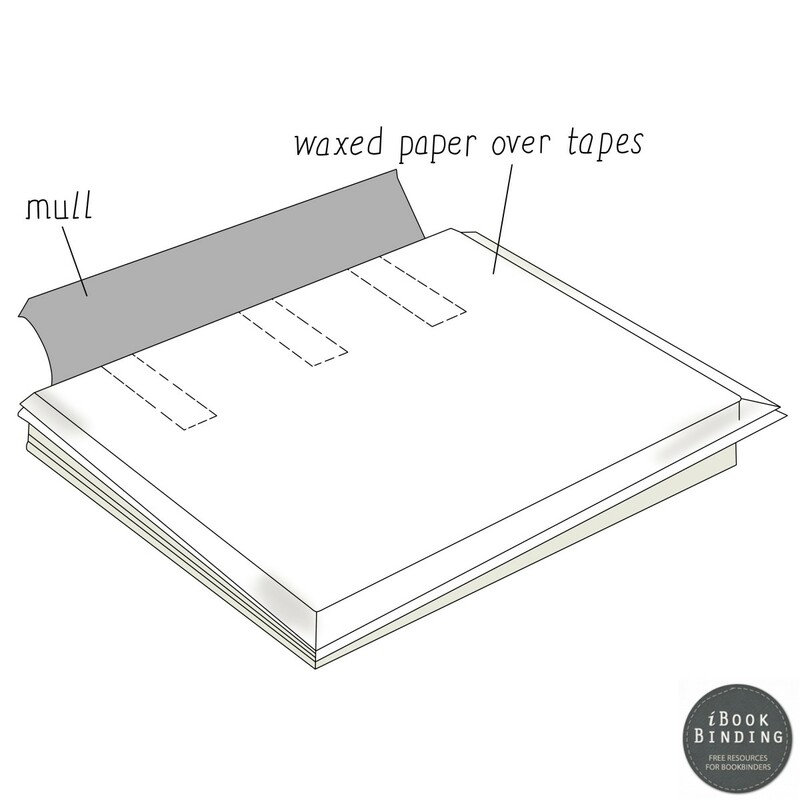 Place your mull on a fresh sheet of wastepaper and apply a thin coat of paste into it. Make sure that the paste reaches into the weaves because this would make the grip stronger. Put some paste onto the back of the signatures as well, and spread it out onto the surface. Use your fingers to apply more tapes onto the paste but the paste layer should still be thin. A thick layer just cracks up and weakens the grip of the mull. This is done so that the mull can easily hold onto the signatures. Now carefully lay the mull onto the signatures. If required, apply a little more paste onto the mull as shown in figure 67, and then press it down firmly onto the back of the signatures. Leave your work for drying for about 12 hours; you can let it remain in the press till then. 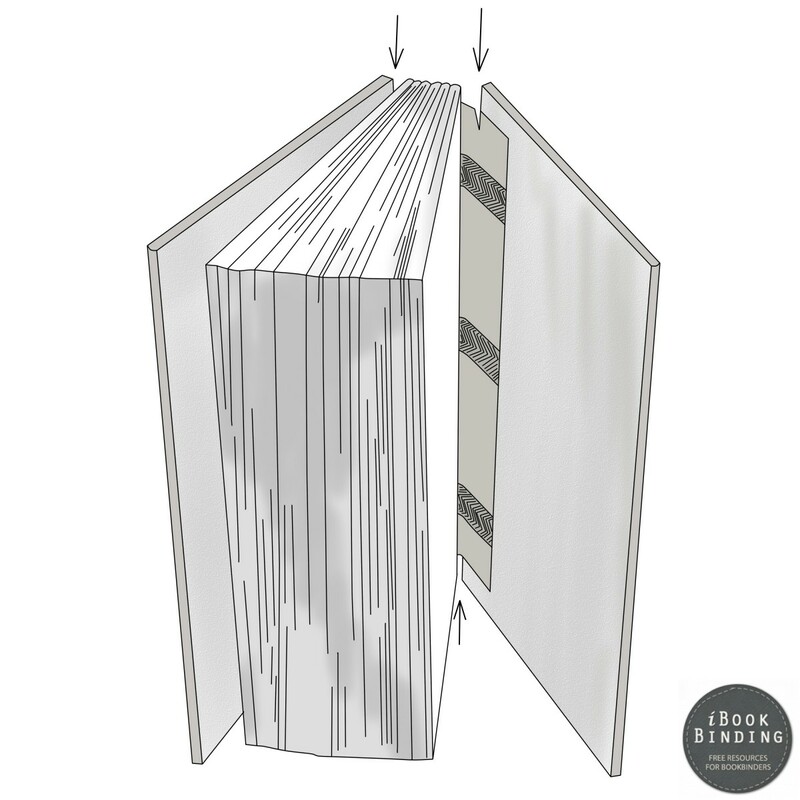 Books can be protected and supported with three types of binding boards; the front, back and backbone strip cover. Rounded books can also be bounded with just the front and back cover boards; the backbone strip of these books is supported with heavy paper that is either attached to the inside of the cover material or affixed onto the signatures. Generally, your board thickness should be about an inch or so if your books are of a normal size. However, if your books have more weight, your chosen boards should also be heavier and thicker. Before you cut the front and back boards, make sure the edge of your knife is sharp enough. Now take the carpenter’s square and cut the cover boards according to the size of your book. The board should be about one eight of an inch more than the actual size of your book on the upper, bottom and side edges. At the hinges, the thickness should be more than two boards as depicted in figure 68. Now you would have to cut a board for the backbone. Measure the width of the combined signatures, and add twice the thickness of the cover board to it. This value should be the width of the back strip board. A better way to calculate the width is to place your signatures between the front and back boards; wrap a clean sheet of paper onto this, sharpening the creases along the edges as illustrated in figure 69. Now the distance between the between the crease is the width of the back strip board, whereas the height would be equal to the length of the front and back boards. With these measurements, cut the board, once again ensuring that the knife is sharp. Use a sandpaper and round off the edges of all the three boards. This provides a better surface for the cover material; a sharp edge can rip the fabric if it is not strong enough. Place your signatures onto the workbench. Take two sheets of waxed paper that are a size slightly larger than your book. Cover the top of the signatures with these sheets such that the surface is covered, and push them against the hinge of your book as shown in figure 70. You can skip this if you want to, but that might get some paste on your signatures when attaching the boards. This would be difficult to clean so use waxed paper sheets as a protection. If you remember, you left the mull extended on both sides of the backbone. 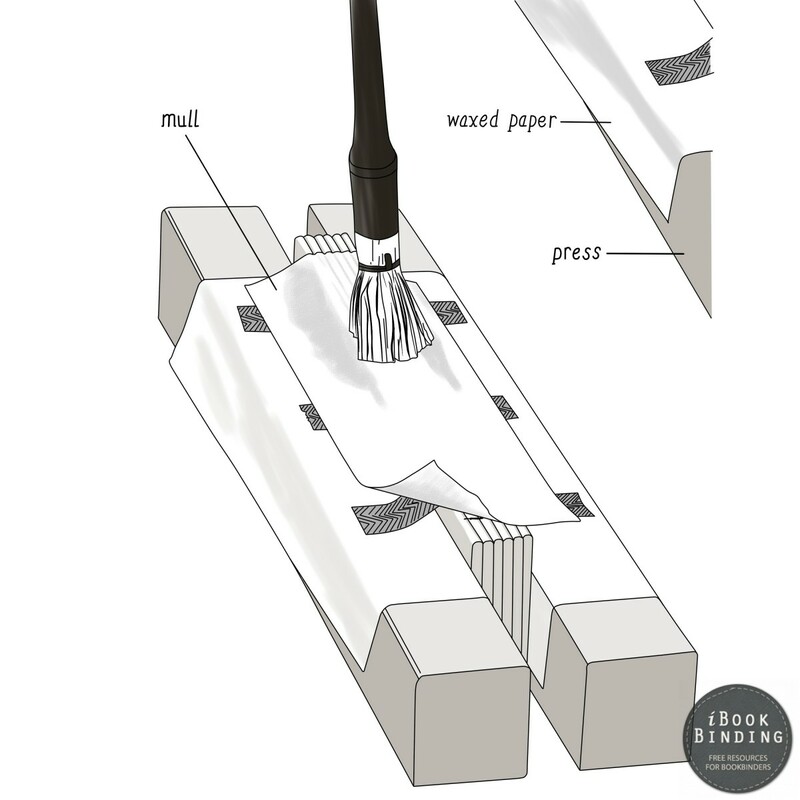 Now pull this leftover piece of mull onto the waxed paper and apply paste on it as shown in figure 71. Remove the upper waxed sheet, and throw it off. 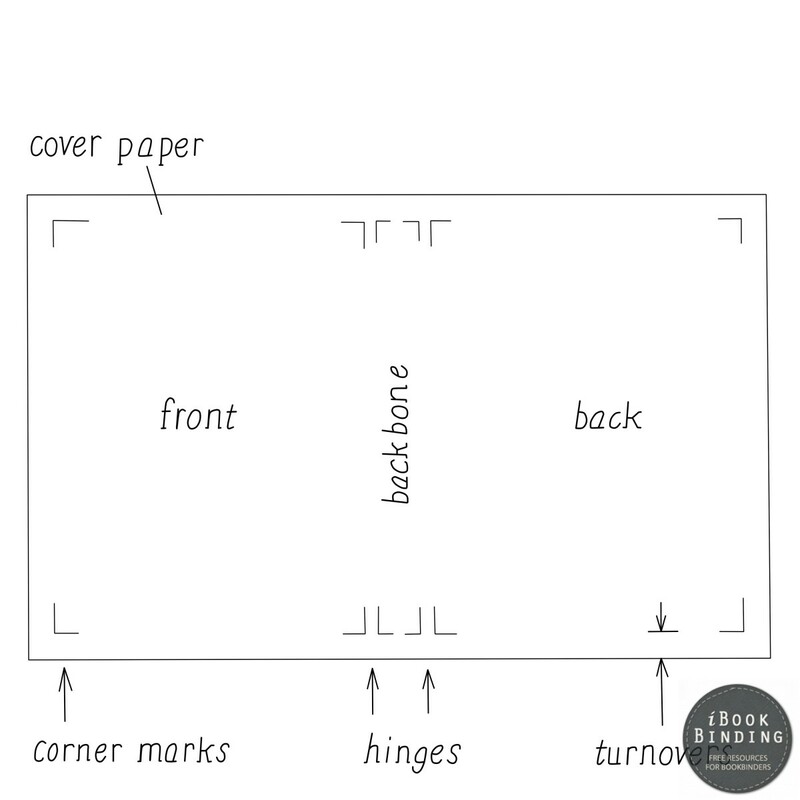 Place your cover board onto the pasted mull, ensuring that you have left equal spaces on all three sides of the book. Refer to figure 72. Apply pressure onto the board until the mull affixes to it. Open the board and place it onto another clean board for support as shown in figure 73. Now you can also remove the second sheet of waxed paper. Place a fresh rubbing sheet onto the mull; press and rub it well so that the mull attaches firmly onto the board. If required, you can strengthen the grip of the mull even more by using tapes. Put some tape onto the signature, and place a clean wastepaper below them as shown in figure 74. Now apply some paste onto the tape as well because it can absorb more glue than paper does, which provides a better grip. Attach the tapes onto the mull and remove the waste paper beneath them. Now lay a clean sheet of waxed paper and close the board over it while pressing it firmly along the side. Let the cover dry for about a minute or two, then pry it open slightly to ensure that the tapes are at the correct positions. If they are, shut the cover again, and press it with weights. Leave you work as it is for half an hour. When the paste has dried up well, open the cover again. Trim the mull and tape as shown in figure 75. In this same manner, attach the back cover board. After doing this, lay heavy weights onto you work, and leave it to dry for the entire night. After about twelve hours or so, make your book stand up straight onto the bottom edge. Now open the covers slightly and pry open the joint between the hinge and the cover only a little bit. In this space, cut open a slit that it about 5/8 inches wide along the length of the mull. Use a sharp knife for this so the silts are neat. In this manner, create two slots at the upper edge and two at the bottom. These slits will be used to slide down the cover material inside the boards for a stronger grip. Further details can be found in figure 76. Now attach the backboard onto the hinge of the book. 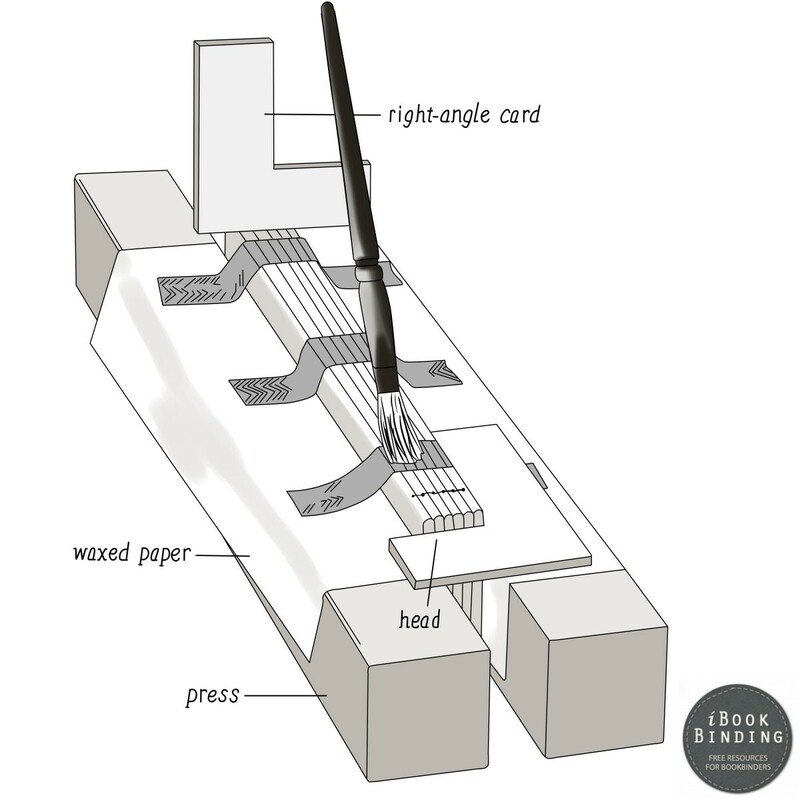 Place the cut board onto a clean wastepaper sheet and apply paste on it. Pick up the board and careful lay it onto the backbone of the book. Ascertain that the board is placed properly, and then press it down. Do this step really carefully. If you do not attach this board properly, it can misalign the entire book, and spoil all your efforts. Leave your work for drying. You can either cover your board with a cloth or paper. In most cases, cloth is a better choice, but if you use paper, make sure that the thickness is adequate enough. Also ascertain that you measure and cut the materials in a precise manner. If the cuts are not straight or clean enough, it would become prominent when you fix the endsheets. Moreover, you would be using a lot of glue in this task which can stain both paper and cloth. As such, you should take great care when attaching the covering material. Select a cloth or paper of a size that is large enough to cover both the front and the back boards along with the back strip, in a single piece. Place your chosen material onto the work bench after ascertaining that the surface is absolutely clean. Now pick up a steel rule and a carpenter’s square, and mark the corners of all three boards with a sharp pencil as illustrated in figure 77. Make sure that the turnover of the cover material would be the same on both the front and back side. A rule of the thumb is to take the size of the turnover as four times the thickness of the board. After drawing an accurate layout, cut the cover material; use a carpenter’s square with the cutting tool when doing this so the edges are absolutely straight. If your cover material is paper, use a blade, and if it is cloth, use a pair of shears. Spread the cover material onto the bench after covering the surface with a fresh sheet of wastepaper. Apply some paste onto the area marked for the back strip board. Pick up your assembled book, and place it hinges on the designated area, properly between the marks. Press the book onto the cover material for a stronger hold. Lay the book back down on the surface, and rub the cover material with a clean rubbing sheet. Before proceeding onto the next step, let the paste dry. Now slightly turn the cover material above the edges of the back strip board as shown in figure 78. Pull open the inside of the cover material, and apply paste onto it. Spread the paste evenly over the surface in a direction from the centre to the outer edges. Also put a little amount of glue into the hinges for a stronger hold. Now lay the cover material onto the front board; ensure that corners of the board are aligned with the marks that you sketched out as shown in figure 79. Press down the paper and then place a rubbing sheet over it. Use a clean cloth, and keep rubbing your work so that no air bubbles remain between the board and the cover. When the cover material onto the front board is attached firmly, you can start working on the backboard. Apply paste onto the inside of the cover material, and once again brush some paste into the hinges as well as depicted in figure 80. Now pry open the book, and move the back board onto the cover material slowly until it aligns up with the marked corners as illustrated in figure 81. Press the paper onto the edge of the board. Apply a slight force onto the edge until the board and the material stick well. Now cover the material with a new rubbing sheet, and press it until the paste dries up. 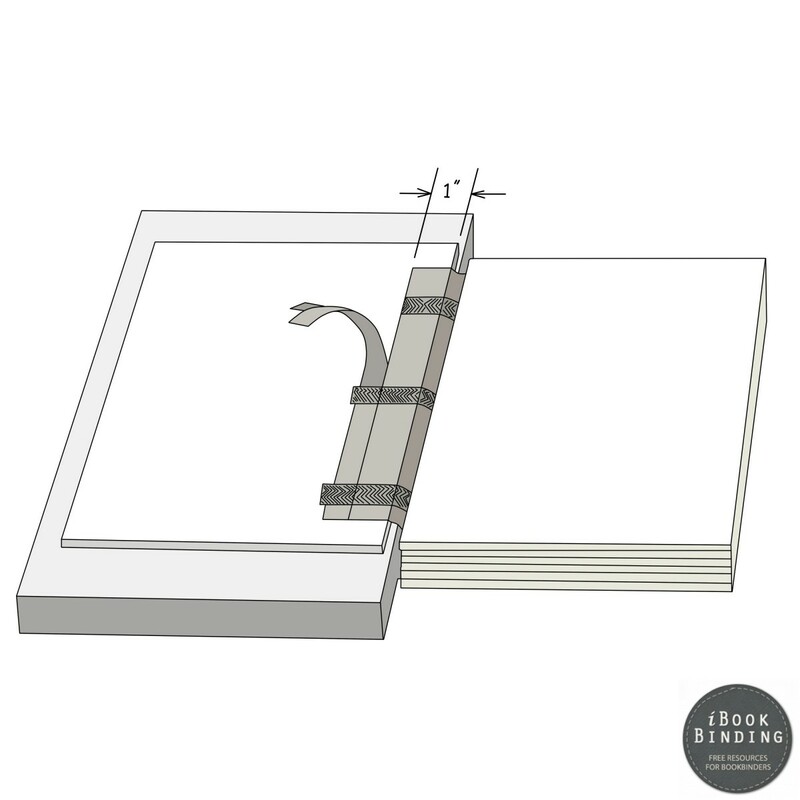 While you press the cover material, make a slight crease along the outer edges of the board, and glide the paper across the length of both hinges with a folding stick as shown in figure 82. 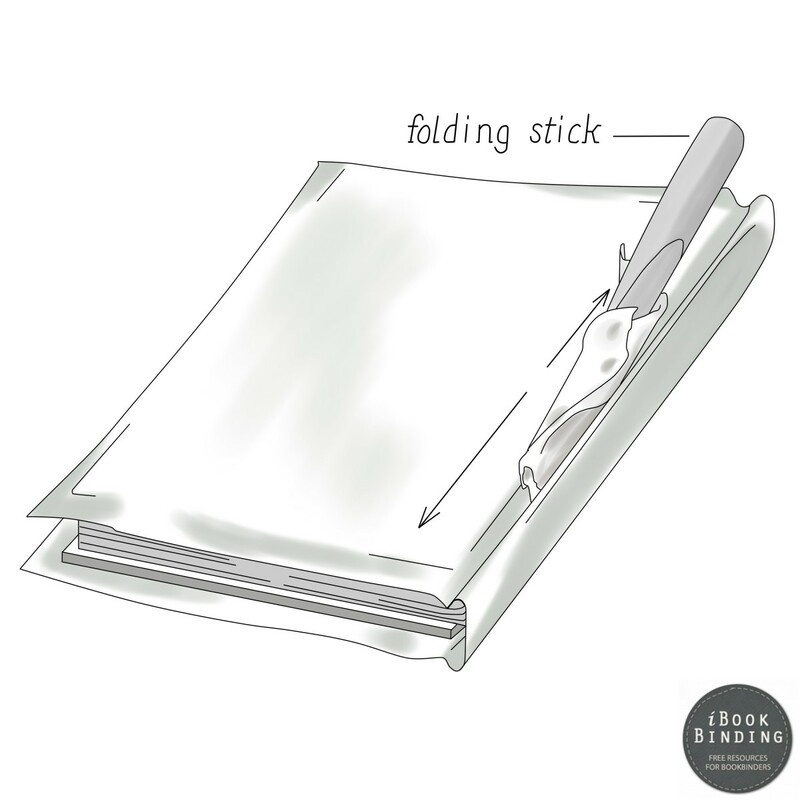 Make sure your folding stick is covered with a clean cloth so no stains can appear. Lay your work between clean sheets of waxed paper and let it dry for half an hour. If there is a need, keep pressing the cover material from time to time to strengthen the grip, remove the air bubbles and avoid the material from wrinkling. You should be glad now, because the toughest part is over.